Plus, restaurants are overrated and completely jammm packed on Vday. Something about the fresh, colorful, vibrant ingredients that almost always accompany raw vegan dishes are so enticingly yummy. 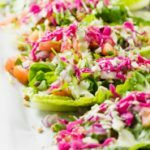 One of the first raw vegan dishes that I ever tried, and is now my favorite, is raw vegan romaine lettuce boat tacos. Soooo much goodness in one dish. Get ready. Even though it looks extremely complicated.. It's notttt! This is such a perfect recipe for beginners. Do not be afraid my friends. YOU CAN DO THIS! It's pretty much fail proof too. There is NO cooking involved, say whattt! That's the beauty of raw foods. 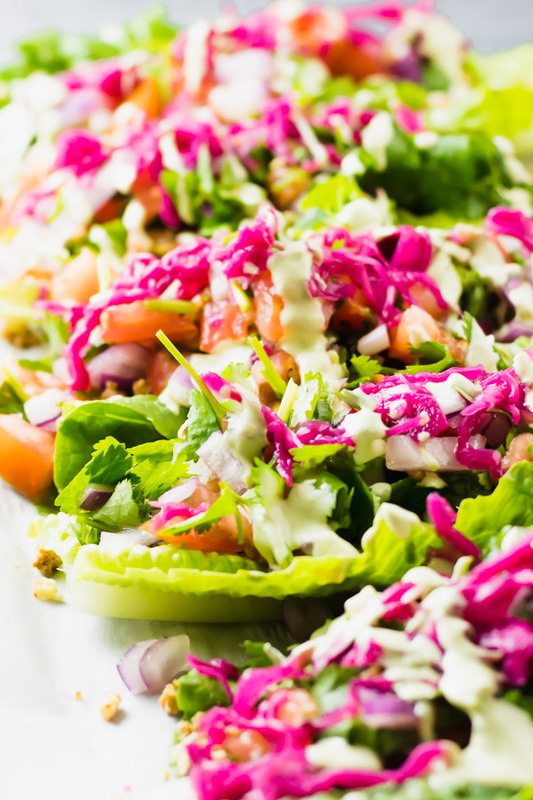 All you have to do is prepare each part, layer the raw vegan romaine tacos, and eat eat eat. The quicker I can get to the 'eating' part, the happier I am. #nothappywhenhungry Am I rightttt? 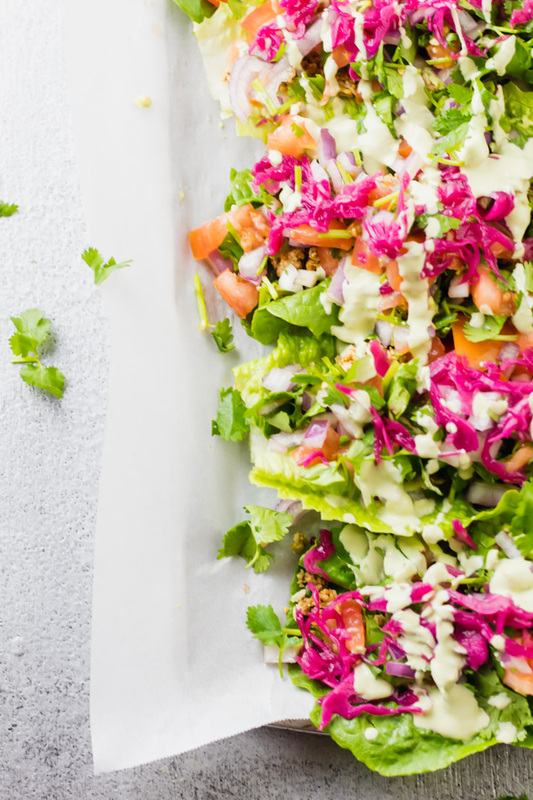 These raw vegan romaine lettuce tacos are so colorful and vibrant and happy, which makes for a perfect dish for a special occasion, a birthday, a celebration, or ummm VALENTINE'S DAY, which is right around the corner.. so ladies and gents.. take note 😉 and surprise, errr scratch that, WOW your Valentine with this yummy yummy dish. Don't forget the sauce. Although this dish is super yummy on its own, make it even more unbelievably tasty by drizzling a little bit (more like a lot a bit), of our Ultimate Green Cilantro Garlic Sauce (click for recipe). This recipe is a bonus because it includes three other recipes in one! It's just one of those dishes where you need three recipes to make one recipe hahaha, #complicatedveganprobs. But no need to fear. It's really not hard. I've broken down the steps. It's like I'll be right there with ya in the kitchen guiding you along. Start by making the Walnut Meat first.. you're going to have to soak the walnuts and sundried tomatoes so make sure to get that started first and then you can work on everything else while they soak. Make sure to only soak the walnuts for about 20 minutes! If you soak any longer, the meat tends to get a mooshy, paste-like texture which is not cool. Also make sure nottt to overprocess once you get everything in the food processor. Just process enough that everything is broken down, well combined, but still crumbly. See this picture below. PS. You can eat as is for a raw vegan version orrrr if ya wanna get naughty, you can totally roast this in the oven at 350F for 20 minutes, and the flavor intensifies so much more. The Pico De Gallo is super simple and flexible. I offer measurements so that you can get a general idea but feel free to experiment with your own quantities. Basically chop up all of the ingredients (tomatoes, red onions, garlic and cilantro), and cover with lime juice. YUM. anddd the guac, can't forget the guac! I don't get too complicated with guac. 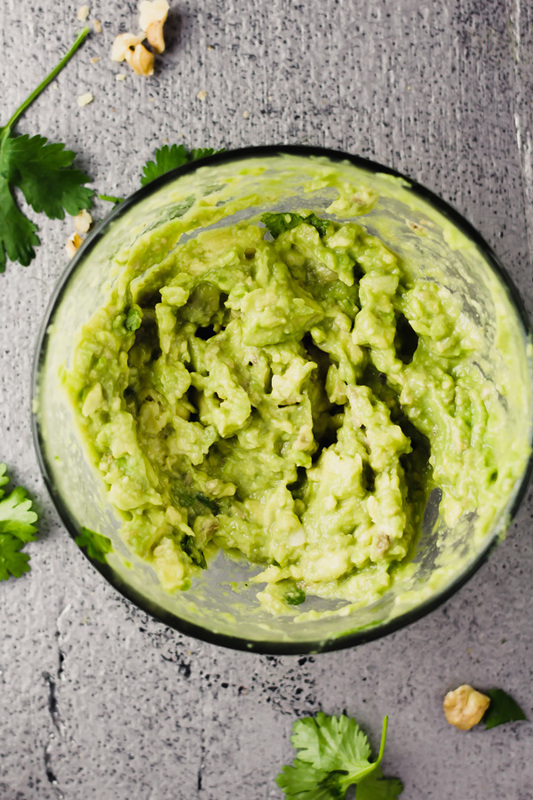 Slice your avocado in half, throw it in a bowl, add some lime juice and mash up with a fork! You can also add some minced garlic and dash of cayenne or pepper. As you can probably already tell, the three recipes that make the really big main recipe are super easy and simple. 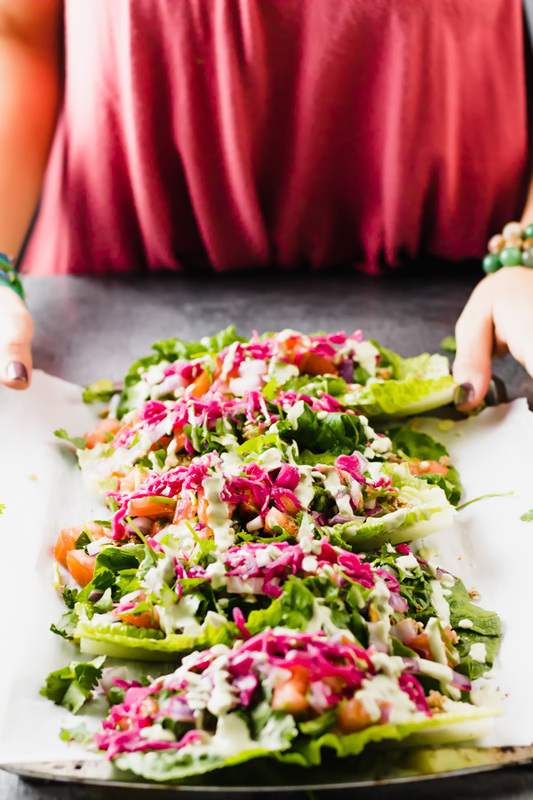 Once you've made each part, layer your raw vegan romaine lettuce tacos as you wish and enjoy. Oh and don't forget the sauceeee! This one goes really well with our Ultimate Green Cilantro Garlic Sauce (click for recipe). Also, let's be friends on Instagram: @sproutingzeneats and tag me if you make this beauty! We're also on Facebook: @sproutingzeneats and on Twitter: SproutingZen. 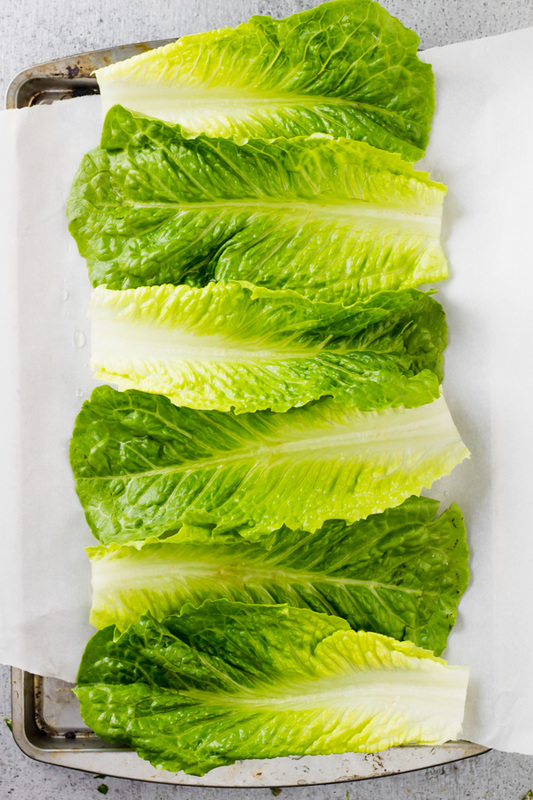 Rinse and drain the romaine lettuce leaves and set aside. 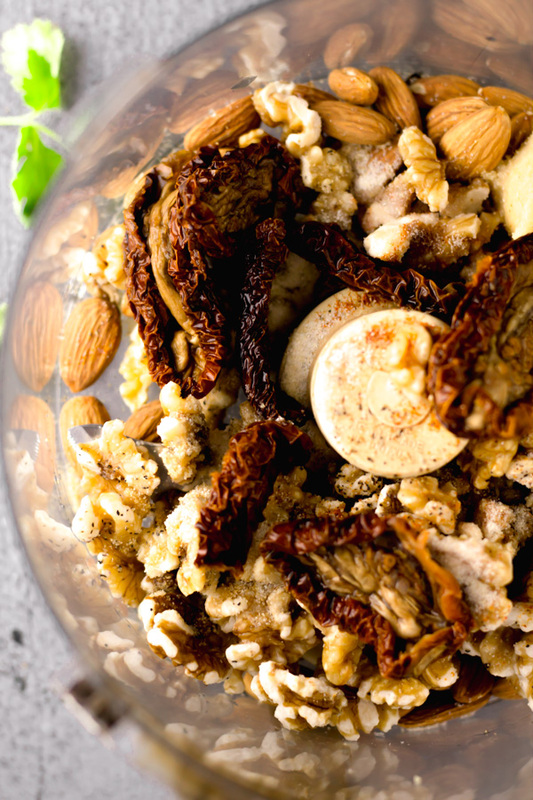 Soak the walnuts and sun-dried tomatoes for 20 minutes only! 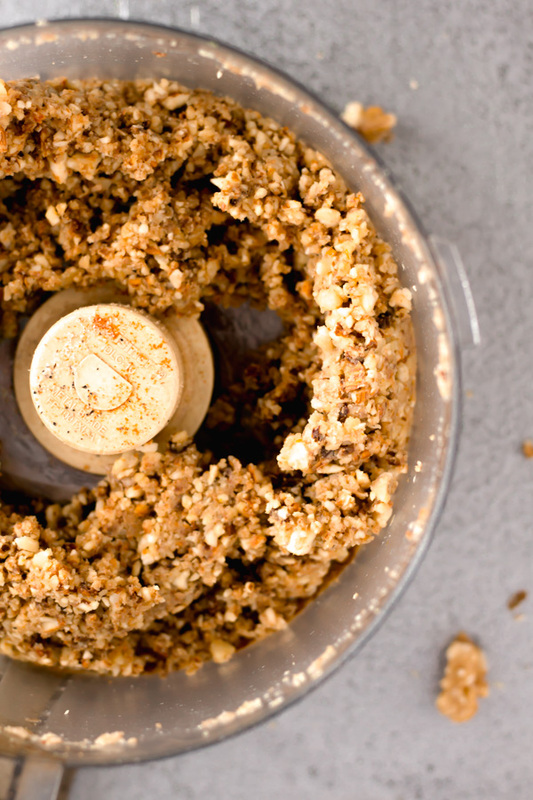 If you soak walnuts for too long, they become too soft and paste-like vs crumbly. If you want raw walnut meat then serve as is (if you’re not raw vegan, you can go ahead and roast the meat in the oven at 350F for 20 minutes for extra YUMMMness! 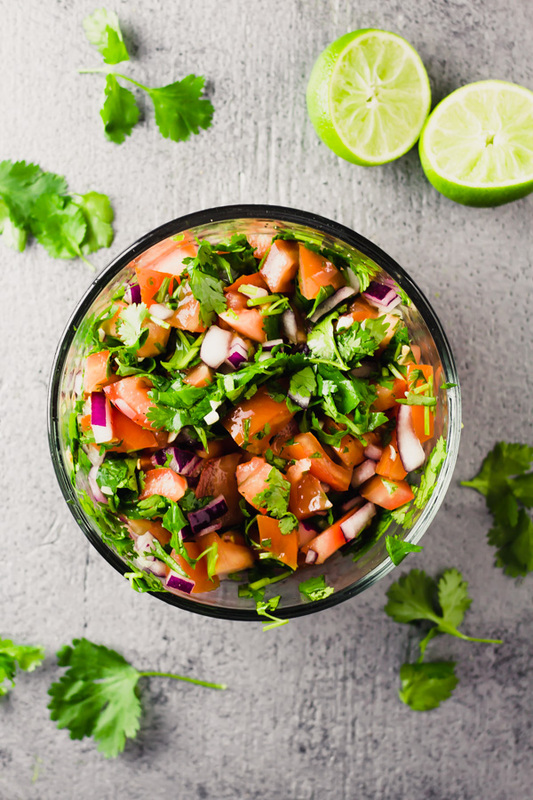 In a bowl add the following: Chopped tomatoes, chopped red onions, chopped cilantro, minced garlic, squeeze the juice of one lime and combine until all ingredients are coated. You can also add a pinch of salt and pepper. However, I keep mine salt-free and it tastes amazing this way. Place the avocado meat in small bowl, add the minced garlic and add the juice of one lime. Using a fork, mash up the avocado until your desired consistency. You can also add a dash of cayenne and black pepper to taste. Lay out romaine lettuce boats on a dish and begin adding the toppings. I like to follow this particular order: walnut meat, pico de gallo, guac, and then any extra toppings I might have on hand such as jalapenos, sauerkraut, hot sauce, and green cilantro garlic sauce. Serve and ENJOY! So gooood. Each romaine lettuce makes one taco. 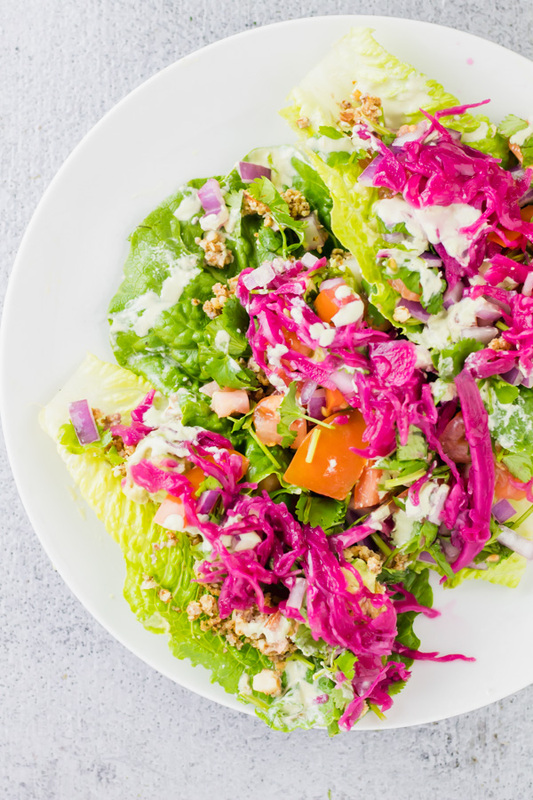 You can usually buy a head of romaine lettuce and it’ll bring plenty of leaves for this recipe. I suggest 7 to 8 because that’s how much the walnut meat, pico de gallo, and guac are enough for but feel free to double the recipe if you need to make more tacos. This recipe is very flexible. Feel free to add or remove any toppings or ingredients to suit your needs and taste buds. This is a raw meal which is best served and consumed immediately. Left overs will last in the fridge for about 2 days in airtight sealed glass containers. Thanks Albert!! Give the taco meat a try, I’m sure you’re gonna love it. It’s sooo tasty. This is SO fresh and vibrant! I can’t wait to try the taco meat. Those sun dried tomatoes! This looks like an amazing recipe. I think I might make it and take it to work for my co-workers to have tomorrow. I soooo love your recipes! Always something new to try! I remember my one month foray into a raw diet ……. when I went back to cooking again I thought, “WHAAAATTT??? Everything takes so long to prepare!” Raw is soooo easy. I really miss eating that way. Ohh I think your co workers would LOVEEEE this. Let me know how it goes if you do go ahead and make it!! 🙂 Also, I know exactly what you mean.. cooking does tend to take longer than just “preparing” a raw dish but with cooked meals there is the convenience of being able to cook it ahead of time and store it for a later date. With raw foods, I usually can’t meal prep as much because since everything is fresh, it’ll spoil sooner. ah everything has a pros and cons haha. Very colorful and creative! Keep up the good work with wholesome foods. That’s what’s all about. 🙂 Thanks for sharing. Wow Jen, my only ‘slight’ problem is I kept salivating whilst looking at your gorgeous vibrant photos! This post is a true celebration of wholesome healthy food! Love the idea of walnut ‘meat’ with sun dried tomatoes. Will be sure to try this dish when the days get warmer! Tania, you had me there for a second. 😛 Hahaha. Thank you for your beautiful comments, always make my day. That walnut meat truly is delicious with so many flavors involved! This is so colourful! I have got to try this out – just the thing to brighten up my kitchen in dready January. Oh yes these colors are perfect to brighten up a dready winter evening! Yes yes yes try it and let me know. I’m in love with it. These tacos are beautiful. Have not made walnut “meat” before so I am quite curious. Thank you Jenna. The garlic sauce is soooo good. This is a fantastic idea! I’ve never thought to use walnut and sundried tomatoes as ‘meat’. The sundried tomatoes are a brilliant addition – they are super flavourful and a bit oily so they’d add that right meaty feel. This is definitely something I would recreate! 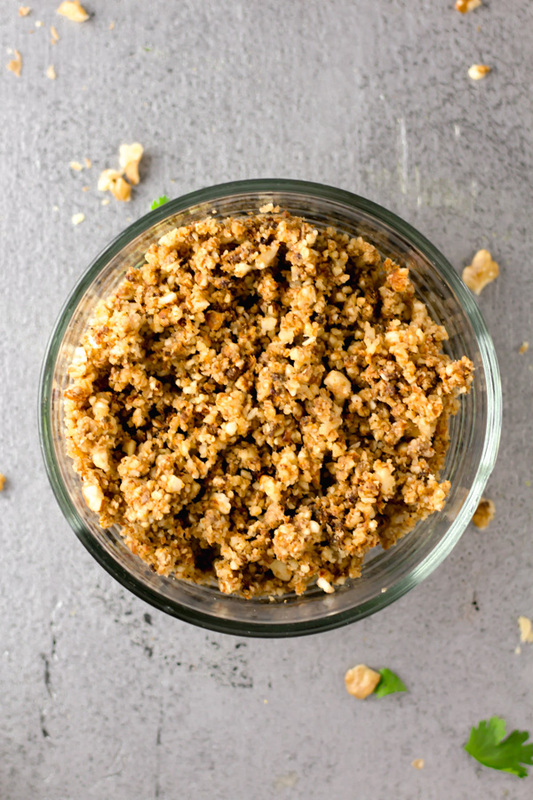 I’ve had walnut meat previously without knowing it was walnut (but knowing it was vegan), and when my friend told me what she did, I was absolutely shocked – I didn’t even miss meat at all! They look so pretty and sound so tasty I had to pin this recipe to revisit later! Yum! These look very good, I am growing my vegan recipe collection to make sure am ready for and friends with different dietary needs. This looks like a winner! Hi Ali, Yes that is a great idea, to have several recipes ready for friends with dietary restrictions. I am sure they would love this one. Yum!!!! Def gonna try this. Sharing! I would love to get this dinner for V-day and better yet I have everything for this salad so I might make it tonight!! We don’t have enough tacos here in the UK – so I usually make do by making my own, and these ones look fabulous! Definitely going to try them, yay! Babe this looks so colorful and delicious! Great job I love it! Yayayay! Glad you like them!! Aren’t they so cute for Vday?! I love the pink dusting on top. Haha! Thanks Heather for such an awesome comment! These are pretty delicious!! <3 Have a beautiful weekend!!! 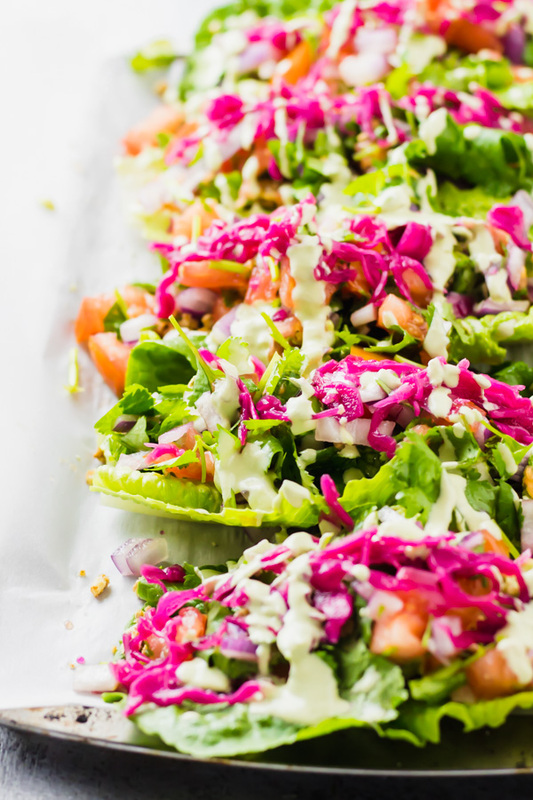 These raw tacos look amazing! Can’t wait to give this a try! Thanks Terri! They’re definitely delicious! <3 Have a wonderful weekend. Hey Katherine! That’s awesome thank you so much for featuring this recipe. I am heading to your page right now to check it out!! Happy Weekend.